I couldn't make anything but fantastical gingerbread for my final Domestic Sluttery recipe, could I? From that first foray into tiny mug houses, I've known that a life of 3D gingerbread was for me. I'm still inordinately proud of baking a gingerbread TARDIS in celebration of Doctor Who's 50th anniversary (a feat which got me a write-up in the national press, don't you know) - so much so, I couldn't actually bring myself to eat it. It sat on my coffee table for ages - weeks, I think - until its roof caved in. No such qualms with these gingerbread unicorns, whose heads and tails were bitten off shortly after these photos were taken. I expect they'll grow back. You may have noticed that unicorns are very important to Team Sluttery. In fact, I'm pretty sure some of us are actually part-unicorn. 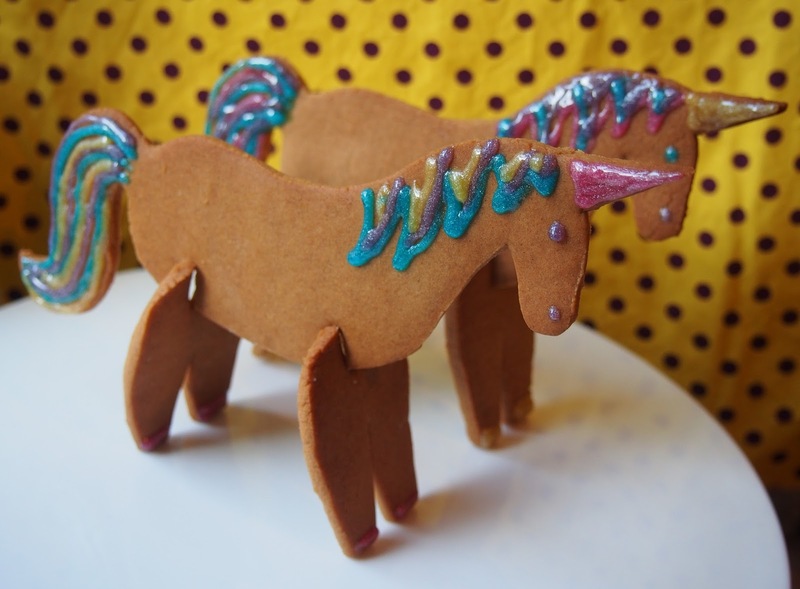 To celebrate our love, I wanted to combine gingerbread and unicorns, and I was inspired by the 3D dinosaur and safari cookie cutters that we've already featured on the site. Since no-one's made a unicorn version yet, I figured it fell to me to draw up a template. I've made you this magical template! After you've downloaded your template, remember to go into your printing preferences and select 'actual size' before you print, otherwise you're going to get a giant unicorn. Not necessarily a bad thing, I know, but not one we're properly prepared for. If you'd like a sturdier shape to cut around, stick your paper print-out onto a clean bit of thick card (remember it's going to be touching the dough, so not the bottom of that manky box that's been sitting on the floor all week), and cut out all the bits. In a large saucepan over a low heat, melt the butter, syrup, and both sugars. Sift the flour, bicarbonate of soda, ginger, and cinnamon into a large bowl, and add the salt. Take the melted butter and sweet stuff mixture off the heat, and add to the dry ingredients. Stir everything until you have a firm dough, then leave to cool in the bowl for a few minutes before rolling out to 2-3cm thick on a floured surface. Wrap in clingfilm and refrigerate for about an hour. Before the chilling time is over, preheat the oven to 180°C/350°F/Gas Mark 4. Line two baking trays with parchment. Print your template if you haven't already, and cut out the shapes. Take the dough out of the fridge, and roll out half of it - on a floured surface, using a floury pin - to 4mm thick. 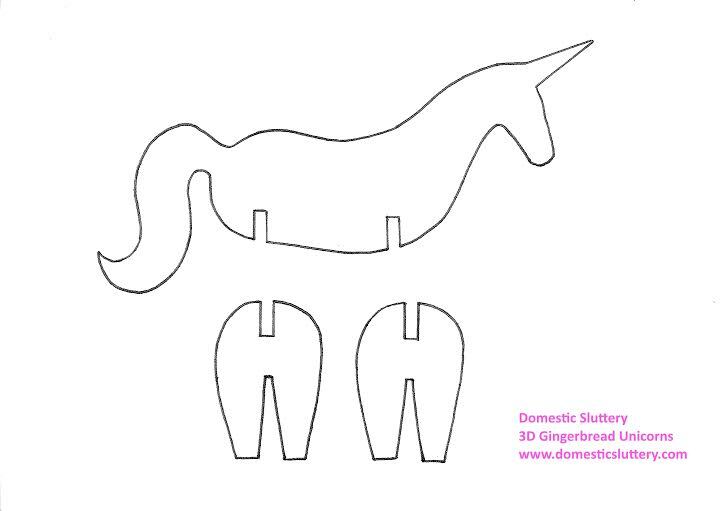 Use a sharp knife to cut out your unicorns, remembering to do enough legs for the bodies. Transfer the pieces to the baking trays and bake in the oven for 12-15 minutes, until golden. Err on the side of slightly overcooked if you're not sure - an extra couple of minutes will make your biscuits a wee bit sturdier. Remove from the oven, and while the biscuits are still warm, use your knife to reopen the leg slots if they've closed up a bit. Pretend it's unicorn surgery. Place the biscuits on a wire rack to cool. Re-line your baking trays, and repeat steps 5-7 for the remaining dough (if you have a massive oven, you can do everything at once - two trays at a time is my limit!). Once the biscuits have cooled, DECORATE. You can go WILD, but glitter and lots of colours are obligatory. Unicorn rules, I'm afraid. Don't forget the hooves. 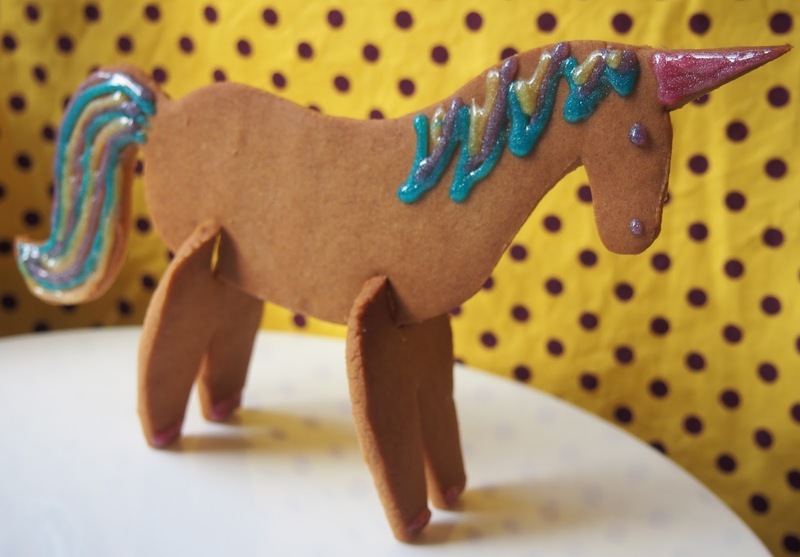 Assemble your unicorns by slotting the legs onto the bodies, and then decorate the other side of each biscuit (if you want - depends on how you'll be presenting them to your adoring public). 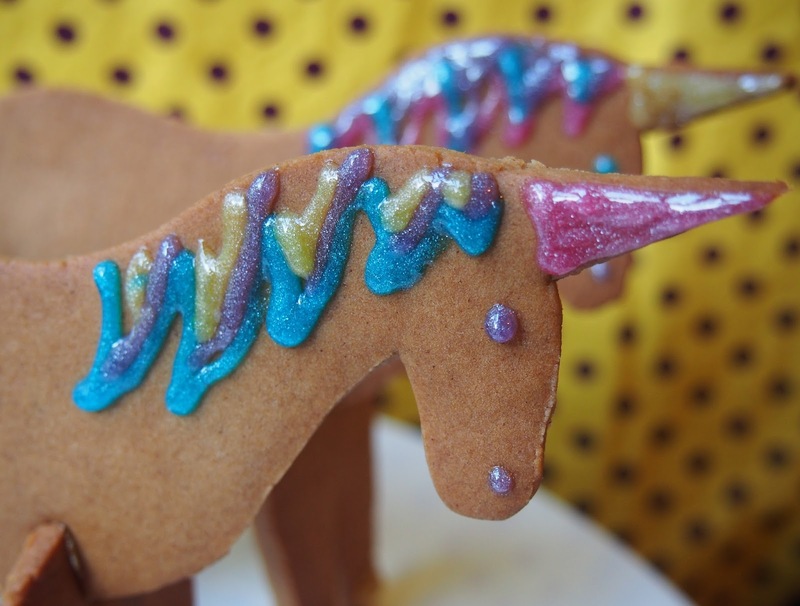 Toss your multi-coloured mane, stamp your sparkly hoof, rear up in a cloud of glitter: you've made 3D gingerbread unicorns, and you are fabulous. * I'm back for Sales Spy on Friday. This is just my foodie goodbye. I knew you'd like them, Cathy! A blessing of unicorns. Isn't that lovely? Thank you for all the blessed confections and concoctions you have given us. You are the Gingerbread Queen! You're welcome, Anon! I should bake myself a gingerbread crown.